The tiny, thin pair of prongs used on plugs in North America and in other parts of the world are nearly impossible to jam into a power outlet if you can’t see what you’re doing. Ten One Design’s new Stella plug improves on the design with something we’ve never seen before: a built-in flashlight that automatically turns on near outlets to light the way. A replacement laptop power cord with a built-in flashlight that glows near an outlet. Makes it so easy to plug your phone in at night. 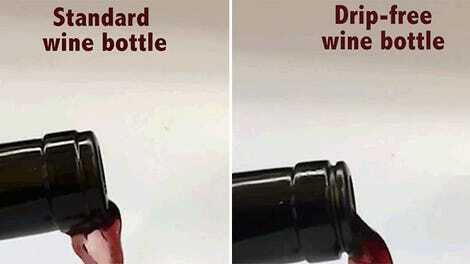 I want every plug I own to have a built-in flashlight. There are bleeding-edge technologies that promise to one day free us from not only having to find a power outlet when we start panicking about a device’s dying battery, but cords and cables altogether. Ossia’s Cota technology, for example, can wirelessly deliver power to electronics the same way wifi delivers internet to your phone and computer. But a practical mass rollout of such a system is still years away. The reality is that cords, plugs, and physical power outlets will be with us for many decades to come, so even the smallest of improvements or innovations that make plugging in our gear less of a hassle are welcome. The surprisingly useful addition of a simple LED flashlight to its plug isn’t the only thing that makes Stella a worthwhile upgrade; Ten One Design’s execution is nearly-perfect. The MacBook version of the Stella comes in two color versions, while the PC version comes in two and three-prong options. The $35 cable is designed to replace the section of cord that connects your laptop’s power brick to a wall outlet, and is currently available in versions for both Apple and PC laptops—but I’d make sure to double-check the compatibility of your machine if you’re buying the Stella for a non-MacBook device. The Stella uses a braided nylon shell that’s more flexible and easier to wind up. I tested the Stella with an older MacBook Pro, and swapping out the brick’s standard power cord for Ten One Design’s upgrade was as simple. The Stella does look a little different than the power cord Apple includes with its MacBooks; trading a thick rubber sheathing for a braided nylon shell. But I much prefer how the Stella looks, and the braided cable is actually more flexible, so it’s easier to wind around the power brick when cable wrangling. Despite the extra tech, the Stella’s plug is still small enough to easily squeeze into a crowded power bar. The business-end of the Stella—the part that actually plugs into an outlet—is only just slightly bulkier than Apple’s. 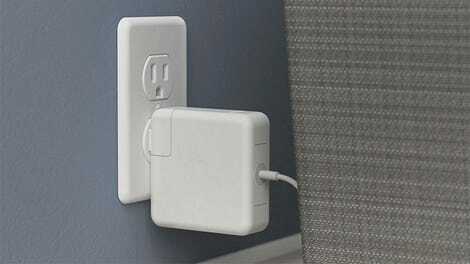 But it can still easily squeeze into a crowded power bar, and Ten One Design has made the braided cord exit the plug at a 45-degree angle which the company claims will help reduce stress and damage at the connection point. It looks like a perfectly normal two-prong plug, but inside the Stella is additional hardware similar to what you’d find inside a non-contact voltage tester, tools electricians use to detect the presence of a live wire without actually having to touch it by detecting the surrounding electrical field. The Stella incorporates a simplified version of this technology to automatically activate an LED when power is detected. It’s not quite as sensitive as the tool an electrician would use, but I found it was able to detect a power outlet from as far as a couple of inches. 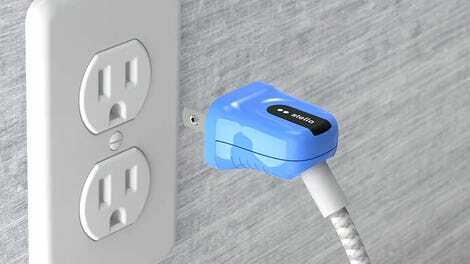 A tiny window protecting an LED is the only hint that this plug does more than meets the eye. The Stella uses a non-replaceable battery to power its low-energy LED that Ten One Design claims will work for at least a decade—well past the life of any laptop. But while the LED is certainly bright enough to illuminate an outlet when it’s a couple of inches away, it’s in no way usable as a flashlight. 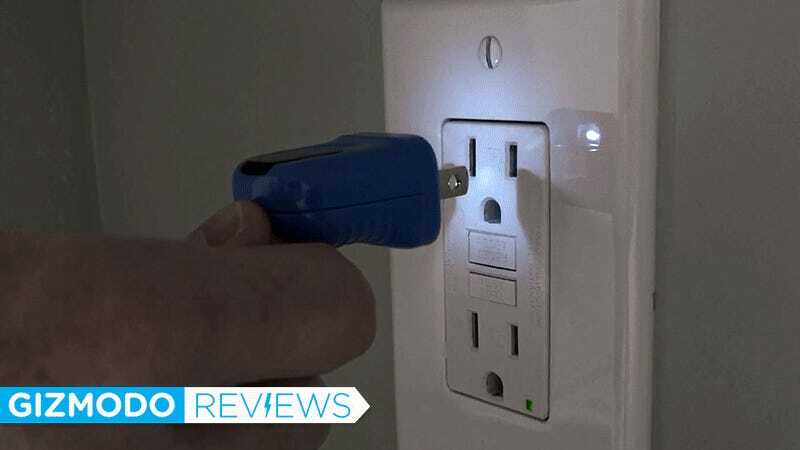 You’ll want to treat it more as a last mile tool (or in this case, a last inches tool) that can save you from having to blindly try to jam a plug into an outlet in the dark, but you’ll need to know where that outlet is first. Is the Stella a must-have upgrade? If your laptop spends its entirely life sitting in one place, then the answer is no. But if your laptop never leaves your side, joining you on business trips and hotel stays where you’re constantly plugging and unplugging your computer into strange and different places, then there’s a strong case to be made for the upgrade. But I actually run into this problem far more often with my iPhone’s charging cable, so if Ten One Design ever manages to squeeze a smart LED into that tiny wall wart, I’ll be first in line with my credit card. What seems like a novelty feature becomes genuinely useful the first time you have to reach under a dark desk to plug in your laptop. At $35 it’s more expensive than Apple’s $19 replacement power cable, but far more functional. Currently only available for laptops, which is disappointing. 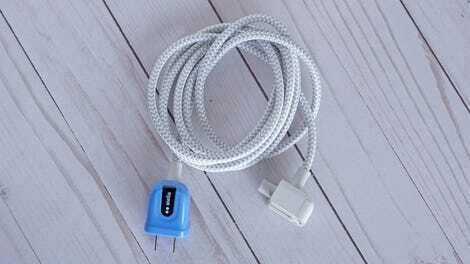 A nylon braided shell around the cable is more flexible and easier to wind than the one Apple includes. The power brick connector on the Apple version of the Stella includes a handy pop-out cord clip to help with cable wrangling. You never need to swap batteries, but the low-power LED is dim and really only useful a few inches away from an outlet.